After digging through a few old hard drives I found the XML (it is now in the cloud so it cant get lost again) and looked at it this past week. Wow that is some complicated stuff I wrote. I am going through line by line to see where the problems are and should have that by the end of the week. Then I can turn my attention to the update. dolomite13 wrote: After digging through a few old hard drives I found the XML (it is now in the cloud so it cant get lost again) and looked at it this past week. Wow that is some complicated stuff I wrote. I am going through line by line to see where the problems are and should have that by the end of the week. Then I can turn my attention to the update. But I like 80's video games! Bring on the Defender! Joust! Donkey Kong! Ms. Pac-Man! Frogger! Galaga! Gorf! BurgerTime! Q*Bert! Oh, and the one with the caterpillar, can't remember the name! Centipede! My dentist had one of those machines in their waiting room in the 90s. As for the graphics. Well it was intended to look sort of crappy video game like. I would like to put together a better look for map if I could manage it. Prioritise the XML, that's what we're keen for! If you happen to find time to make it all nice and shiny then sound, but I personally can appreciate the current design. iAmCaffeine wrote: Prioritise the XML, that's what we're keen for! If you happen to find time to make it all nice and shiny then sound, but I personally can appreciate the current design. Played this map a couple of times. I like the play, but would like to see better, clearer labels for the spaces and such. Also, labels for the nobels. Looks like Image Shack went all greedy and all of the images on here died. I will see if I have them somewhere and try to re upload them to someplace like imgur. Well so far I can't find what drive I put the files on. I'm digging through several old external drives but had to order a power supply because I seem to have lost the one that works with my SeaGate externals. dolomite13 wrote: Well so far I can't find what drive I put the files on. I'm digging through several old external drives but had to order a power supply because I seem to have lost the one that works with my SeaGate externals. The ones that were uploaded to the site should be around somewhere. Talk to BW. I still think that this is an awesome map and hope you can find what you need to finish it. Also this thread was a very useful guide when the images worked - hope you can get them restored soon. 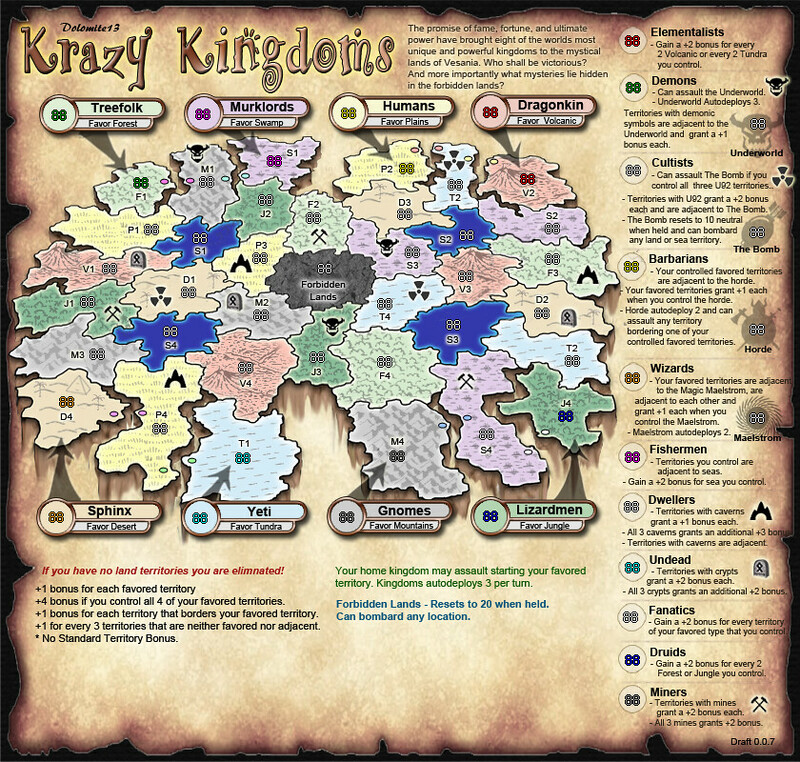 grunion wrote: I still think that this is an awesome map and hope you can find what you need to finish it. Also this thread was a very useful guide when the images worked - hope you can get them restored soon. So far no luck locating them I am so unhappy right now. I have to dig some old hard drives out of my closet and fins the universal adapter and see if they are on any of them. Absolutely nothing I scoured every old hard drive and the files must have been on one of the drives that failed and I had to get rid of. I am so sad. That's a real shame. I was pretty excited for this map. Well, I don't remember all the changes you made after beta started, but weren't they mostly accomplished by photoshopping the map image rather than re-rendering it from scratch? No I think the last few maps I posted were from the original psd's i'm really sad I lost the files. Does anyone know if the XML ever got fixed? 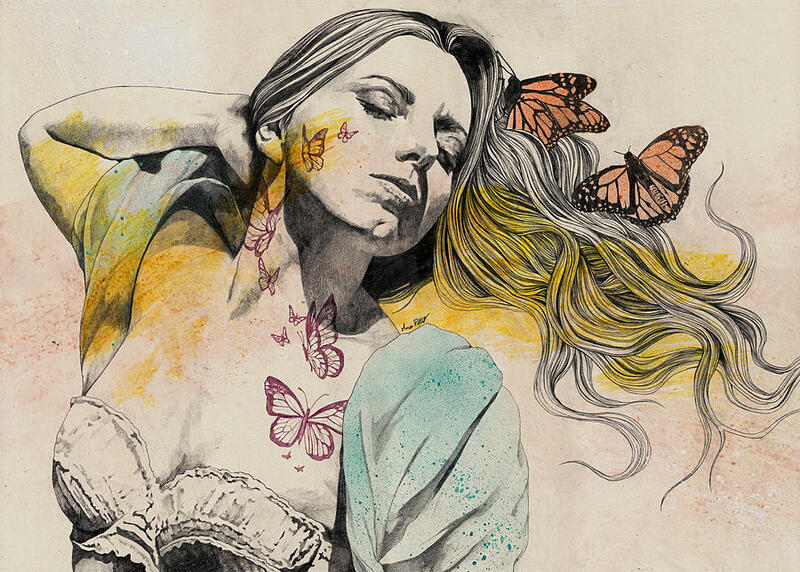 These images are still around if you want to extract what images you can. The version in beta has the live version of the UI, and versions 0.1.7-0.1.9 here have the region textures. 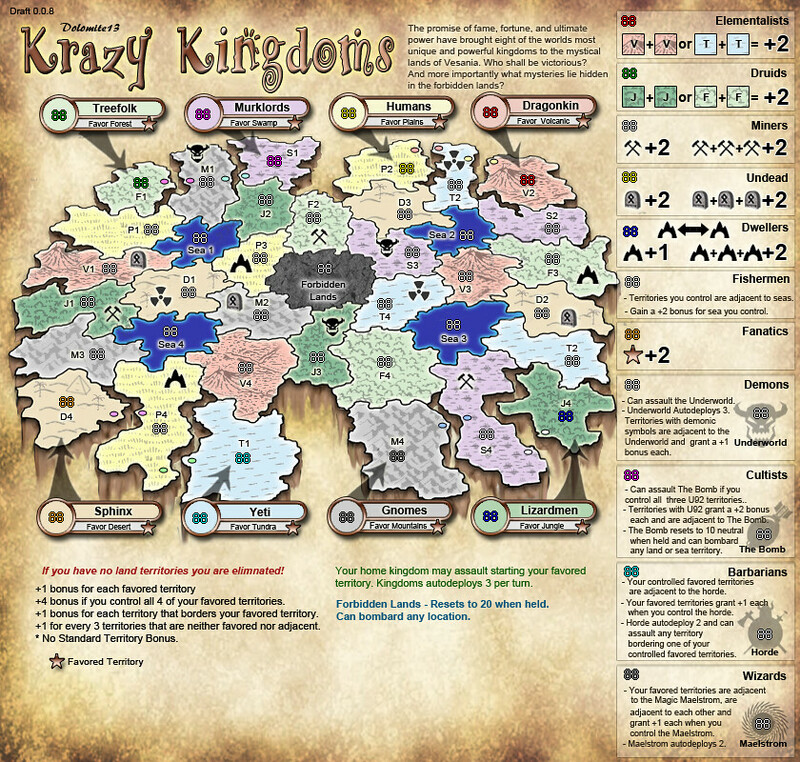 New problems with Krazy Kingdoms, which I am SURE is in beta. game 15866157 in BETA with bots. 1) I am Yeti. Tho Map Inspect shows that I am able to attack from Yeti to T1,2,3, and 4, I have only been able to attack T4. Once I'm on the center map (T4), I cannot attack any of the other T territories (not T1, T2, or T3). 2) Since I took P2 from M2, Map Inspect shows that my M2 territory can attack F2, V4, T2, S2, D4, and J2 (also Sea 2 and Horde). Yet I can only attack the unoccupied territories adjacent to me (D2 and V3). Also posted in beta bug forum. 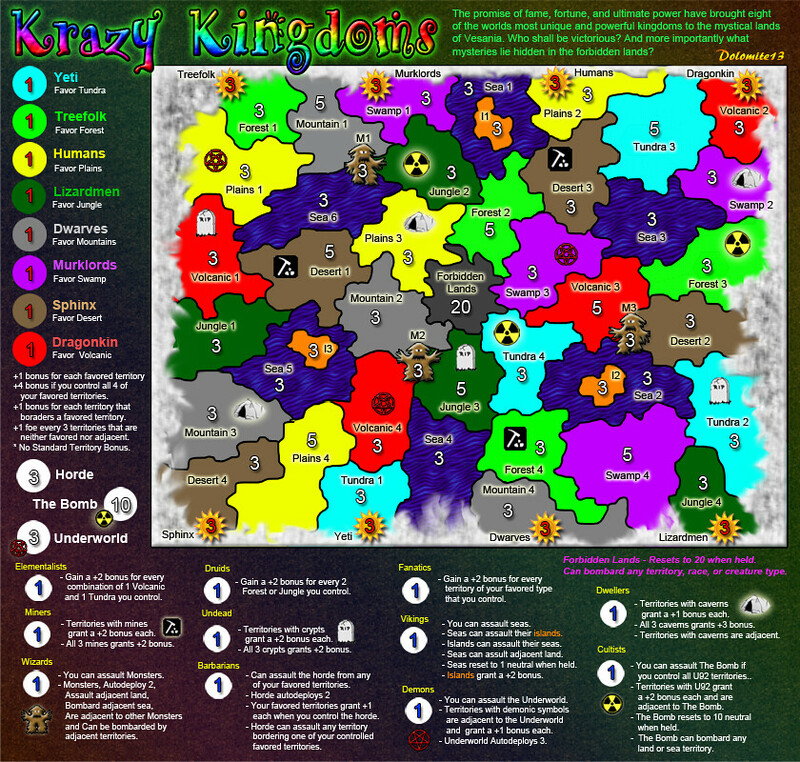 The map inspect do not work with the krazy kingdom map. More specifically, map inspect does not understand conditional border, therefore it also doesn't work properly on labyrinth and temple of jinns ( and maybe some other not sure). For 2), well basically, forget the map inspect. 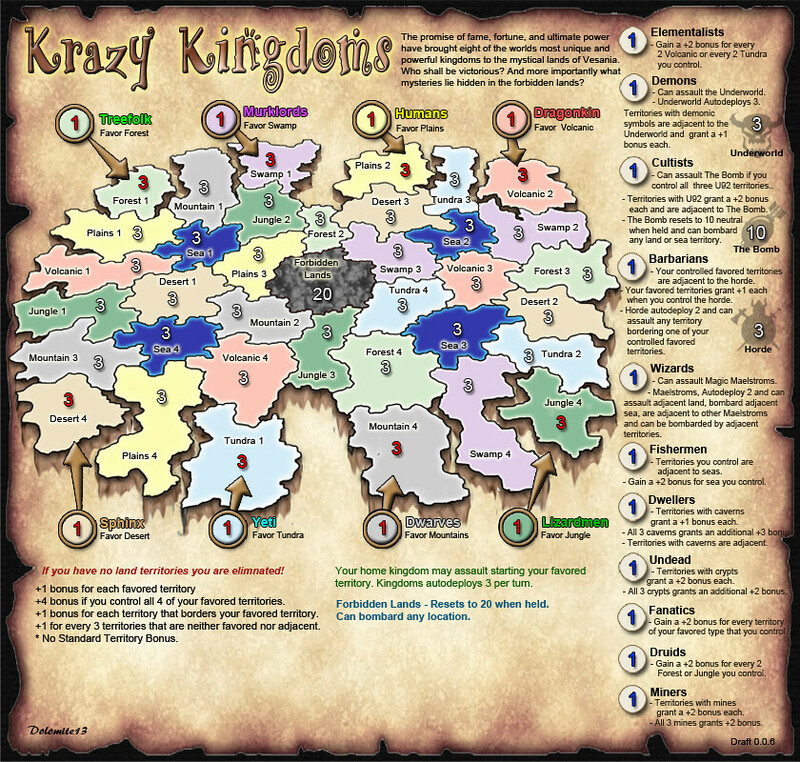 Krazy Kindgom is nice because it has TONS of conditionnal borders, ( while labyrinth and temple of jinns only have a couple of them). So actually the map inspect is showing you anything this territory could attack if you fulfill all conditions. 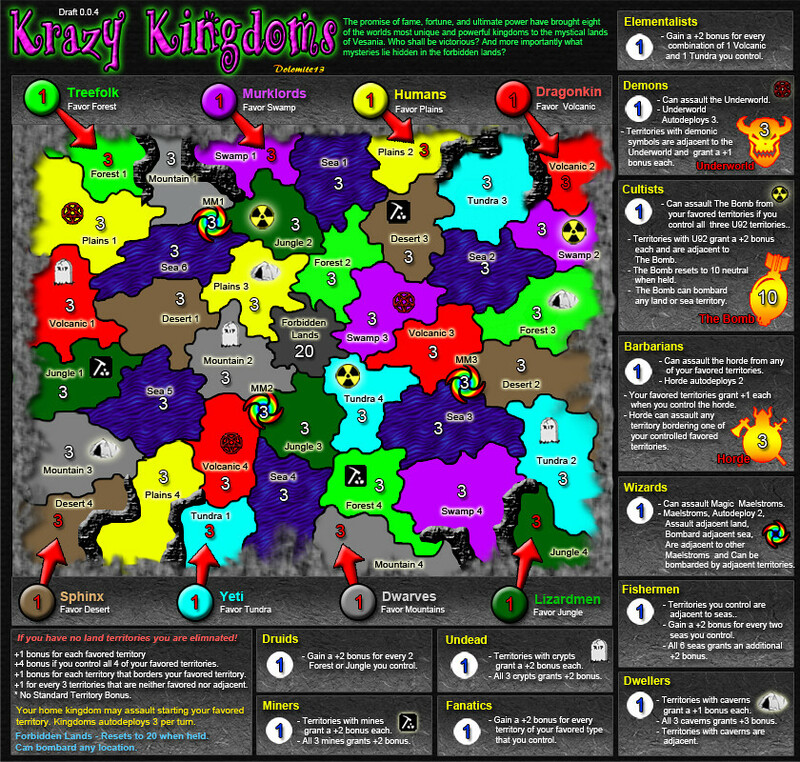 So if you had all the special feature and all kingdoms, M2 could attack all of those territory. 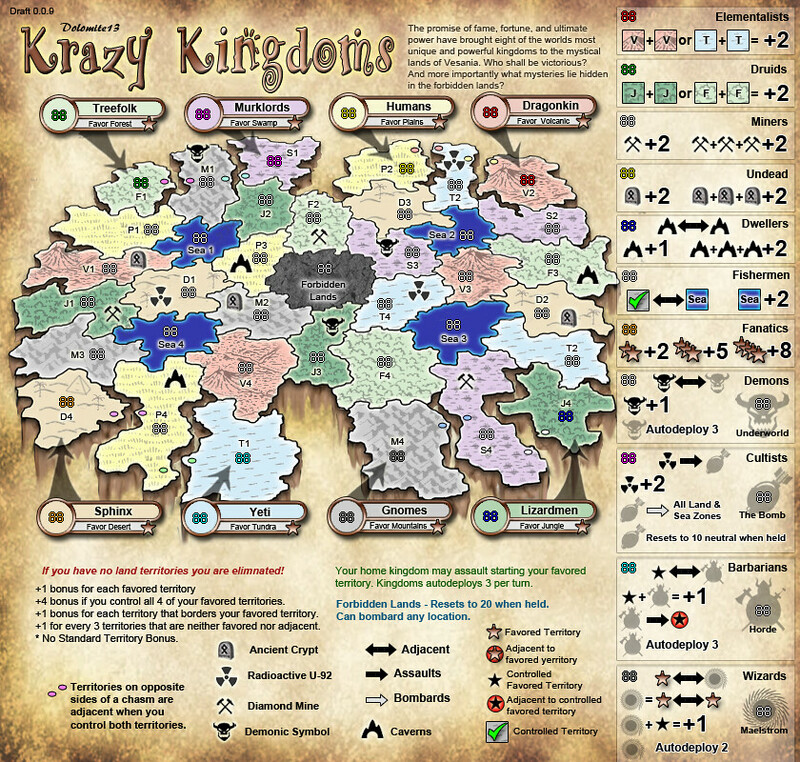 But for example you can't attack Sea 2, unless you have the aquatic feature, you can't attack Horde, unless you have barbarians, etc..
"If you hold no basic land [...] your kingdom may assault any of its favored territories. Otherwise they are not adjacent". So from Gnome you can attack M1, M2, M3 or M4. But once you took any of them, then you cannot attack anymore from the kingdom, because then you are holding a basic land.